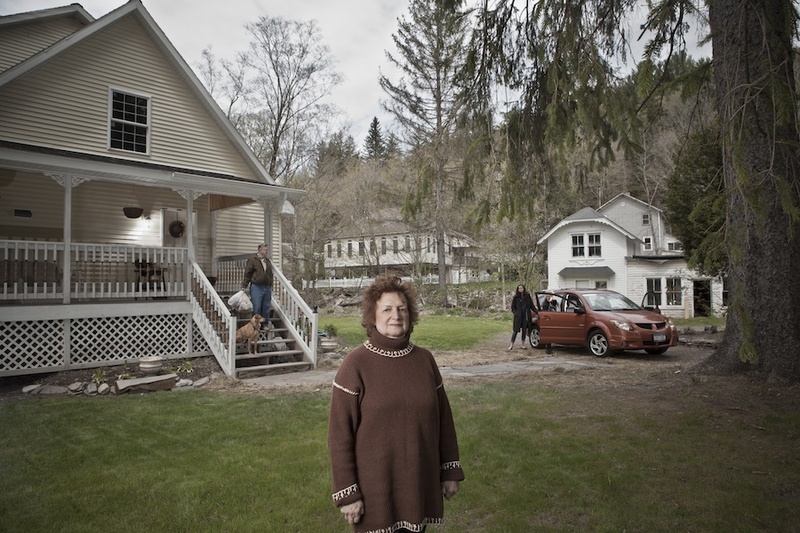 The Watershed Post’s Faces of the Flood Project tells untold stories of the 2011 Catskills floods. The project pairs portrait photography by photographer Christopher Auger-Domínguez with journalism by the staff of the Watershed Post and staff and students from SUNY New Paltz's journalism program. The series is published on August 28, 2012: The one-year anniversary of the floods. My experience of Irene was as a visitor. Sure, we own a home upstate, but our valley didn't get the brunt of the rain. The stream behind the house was full, but it never overflowed at the house. So when I was approached by The Watershed Post about this project, I knew this was a great opportunity to get to know what really happened on the ground during Irene. We discussed the approach and agreed that I'd like to try a cinematic style. I wanted to photograph the individuals reenacting, in a way, what happened to them. Visually, I wanted to say, "This is where they were when it happened, this is the place," as if they were telling the story and you could almost see it. As much as the story was a journalistic project, these were portraits. How could we tell the story of what happened visually and emotionally within a photograph taken almost a year later? What was your concept for the aesthetic of this project? I’m not a journalist, but through the portraiture I wanted to re-tell their experiences in as real a way as possible. I didn’t want it to be a smiley, happy portrait or a snapshot picture. I wanted it to be emotive. But we didn’t want this to be a depressing story. It was meant to be respectful. It might have been heroic, but I didn’t want to force the heroism. These people have been through and are still going through a lot – emotionally, economically. And I wanted to re-tell that as best I could through the portraiture. How did you set these photos up? Part of that cinematic feel is to do mixed lighting, with natural light and artificial light in the same image. So in most of these images, I'm balancing the existing light with a strobe or flash. What was your most elaborate setup? Probably the Vilegi family, because it was inside and there were four of them. I had to make sure that they were all lit up, and I had to show the lighting of the background of the hardware store, so I had to use a lot of bulb flashes that I was screwing into the light fixtures. Yvonne Reuter, also, that was one of the most elaborate. We had four people we had to incorporate into the image, and I wanted to give it a little more dramatic lighting. Why is the lighting dramatic? You’re creating light and shadow where it may not exist in the moment that the photo was taken. Our minds and our eyes are complex organs that understand the story that a still photo often can’t do without help creating the dramatic lighting. It's as if it's making the scene both epic and mundane at the same time. Five months. I think one of the challenges of the time period and trying to get this done is the travel. It’s a huge area; it wasn’t like I could just show up in one location and do all the photos at once. I had to do one day, every other weekend, over the past five to six months. It’s something that took anywhere from an hour to two hours to set up, and then to balance that with the comfort of the subject. Everybody had different comfort levels in front of the camera. Most everybody doesn’t like their picture taken. I had to, for a moment, ask them to step back into that moment. I think it was a lot to ask. What themes tie all of the portraits together? The element that I wanted to incorporate into the images was pointing to the rain, to the water. To make a reference somehow in every image, if I could, to water, which is the other character in the story. So the images...there’s some element of a reference to water. For 25 years, Bill Lonecke knew that the Batavia Kill would take his house someday. Lonecke’s land hugs the curving bank of a sharp swerve in the stream. In 1986, during a flood, the stream changed course and washed part of his backyard away. Afterwards, a New York State Department of Environmental Conservation officer came to assess the damage. To Lonecke, the solution was simple. “I said, 'All I need you guys to let me do is get in there with a machine and put the stream back,'” Lonecke said. Not allowed, said the DEC man. Twenty-five years later, the Batavia Kill finished eroding the bank under Lonecke’s house. It was around noon on Sunday, August 28: Lonecke and his wife and daughter watched from the safety of their cars as the whole house slipped the bank and disintegrated downstream. Lonecke’s water heater is in the streambed. Someone propped it up so that you can see it from the road. He drives by it every day. When did you begin getting angry? Probably right after Christmas, when I realized that nothing was being done to prevent this from happening in the future. That’s when I began to get mad. At C.D. Lane Park [up the street from Lonecke's house], there is anywhere from 30 to 60 inches of sediment that has settled on the bottom of the lake bed. I believe they have no plans to clean it up. I do know that if you have a 5-gallon bucket and you fill half of it with sand, you can't get five gallons into it again. Yeah, but not the right people. It seems to me that whenever I bring these things up to people who should be able to have some authority to makes changes, I get the feeling I’m like a little kid and I get patted on the head. I get the feeling in some cases [that they're thinking]: "It’s your fault for building a house there." Weather patterns are changing … The flood control dams here in Windham were built to withstand a 100-year-flood, of which I’ve lived through four. I'm 57 years old. This is now the 21st century, and eight inches of rain is [just] a heavy storm here. Now a flood is anywhere from 12 to 16 inches. So when I ask -- and I have -- what plans do we have to update all of these things, you’d think I’m sitting there screaming obscenities at people. I’m real tired of hearing "I’m sorry, we can’t do this because we don’t have any money," or "That's not practical." I'm not an engineer, but I’m intelligent enough, and most people are intelligent enough, to get it. How do you think people who lost homes and land in the flood feel a year later? Text by Julia Reischel. Photo: Bill Lonecke with his wife, Barbara (left), and daughter, Cindy (right), standing where their house used to be. It was washed away by the Batavia Kill, which is 50 yards away to the right. Photo by Christopher Auger-Domínguez. Kitty Leer thought she was going to die. The weekend of Hurricane Irene, Leer, 90, was visiting “Villa Yvonne,” her daughter Yvonne Reuter’s country home in Fleischmanns. The family has a long history on the property. Leer’s parents, who left their native Vienna in 1939 to escape Hitler, ran a guesthouse there in the 1950s. Yvonne bought the property in 2004 and built a house there for her close-knit extended family to enjoy. But the morning after Irene, Villa Yvonne was no peaceful haven. The water was rising fast. As Yvonne got into her car to move it to higher ground, she yelled to her niece Elizabeth Leer, 14, to help evacuate her “omi” – a German word for grandmother. “Do not let her go!” Reuter cried. Elizabeth gripped her grandmother’s arm firmly and the two stepped into the water. “I thought, this is it,” Kitty Leer said. A village maintenance worker ended their ordeal. He picked them up in his truck, took them to the car, and then went back to get Yvonne’s husband, George Reuter. The family spent the night at a friend’s house. By the following spring, life at Villa Yvonne was almost back to normal. On a crisp April weekend, Kitty and Elizabeth Leer, along with several other relatives, came up for a visit. Elizabeth confessed she still has nightmares about the flood. But she also has a new confidence in herself. People praise her for saving her grandmother’s life. “I realized I can step up to the plate when I need to,” she said. Yvonne was pleased to see her family together again and the property nearly recovered. The lawn was growing in green and lush, and her relatives were replanting shrubs and flowers. The only major project ahead is tearing down several ruined sheds, the last remnants of her grandparent’s guest house. How did the flood change you? Elizabeth Leer: There is a lot to live up to in my family. My brothers are viewed as heroic because they step up and do what it takes to protect my family. I was happy to prove myself when my family needed it. I learned more about myself. Everyone praised me for saving my grandmother, but I never thought of it like that. I simply thought of it as something I had to push through. Now that I look back, it was much more serious than I originally thought. I have dreams and nightmares where things turn out differently. It was a really crazy experience I will never forget. Yvonne Reuter: The village church provided food for three weeks for the community and volunteers. I found all these pictures in my yard and tacked them up at the church, hoping the owner would stop by to eat and see them. After the flood, I was at the house for at least a week cleaning up debris from my yard. After a period of time, I got sick of it and went to help out at the church. I bounced back and forth between my house and the church. The town is a wonderful community of people and you really saw the positive force of everybody helping each other. No matter who it was or whatever differences you might have with people, silly arguments, that was all gone. This wonderful community spirit was so uplifting and positive. Text by Lisa Phillips, Assistant Professor of Journalism at SUNY New Paltz. Photo: Yvonne Reuter stands in front of "Villa Yvonne," her house in Fleischmanns. Her husband, George, her 90-year-old mother Kitty Leer, and her 14-year-old niece Elizabeth Leer stand on the lawn where they forded waist-high floodwaters during Tropical Storm Irene. Photo by Christopher Auger-Dominguez. Video: The morning after Tropical Storm Irene, Yvonne Reuter, Kitty Leer, and Elizabeth Leer woke up to find flood waters rising around Reuter's home in Fleischmanns, NY. Here's the story of how they escaped -- and how that morning changed their lives. Producer: Lisa A. Phillips Production Assistant: Lauren Scrudato. Faces of the Flood: Yvonne Reuter, Kitty Leer, and Elizabeth Leer from Lisa Phillips on Vimeo. The day after Tropical Storm Irene flood, Matthew Avitabile, a 24-year-old trustee of the village of Middleburgh, heard a rumor that the Gilboa Dam was broken. He didn’t even put on his shoes. Barefoot, he raced out of Middleburgh’s Village Hall on Main Street and ran several blocks to his house. He bundled his teenage brother and sister into the car and drove uphill to the town cemetery, up on a high bluff overlooking the flooding Schoharie Valley. Their father, a reporter for the Times Journal newspaper, was still down there. He was scheduled to cover a visit by Governor Andrew Cuomo to Max V. Shaul State Park, right on the river in the middle of the wide plain of the Schoharie Valley. His children couldn’t reach him, and they knew that he was nowhere near high ground. The rumor that the dam had broken turned out to be false. The Avitabiles and their father found each other. That night, the family ate dinner in the village hall. They were joined by a mother and daughter who couldn’t get to their house and a hitchhiker that Matt Avitabile had picked up in his mad dash up the cemetery hill. They ate spaghetti, and it felt like Thanksgiving. In between evacuations, Avitabile was the center of Middleburgh’s recovery effort. Working the phones at the village hall, he made lists of who needed help and posted them publicly. He dispatched the volunteers who were streaming into town. He organized a series of community barbecues to feed those left homeless with the unrefrigerated food from nearby businesses. He was the one who answered the phone when Governor Cuomo called and when U.S. Senator Kirsten Gillibrandand U.S. Representative Paul Tonko arrived. After the flood, Avitabile decided to run for mayor. On March 16, he won. Now, at age 25, he’s the youngest mayor in Middleburgh village history. Where were you during the flood? On Sunday, the day of Irene, we evacuated because we heard the dam siren. Before we evacuated, I went down to the creek and took a look, and it was bad. But I was the type of person who wouldn’t evacuate until that dam siren blew. When we heard the siren, we left within a minute. That thing is frightening; it’s like an air-raid siren. If we had waited an hour, we couldn’t have gotten out. They blocked the road going in and out of Middleburgh. And lots of little creeks overflowed; it was difficult to get out. We spent the night in the car on Cotton Hill Road [JR]. It was really, really bad. The first night, on Sunday, my father and I walked all the way back -- about one mile each way. I grabbed stuff like food and brought it back. And then we got up really early the next morning, and we heard that the dam was OK for the time being, but my brother and sister didn’t want to come back into town. 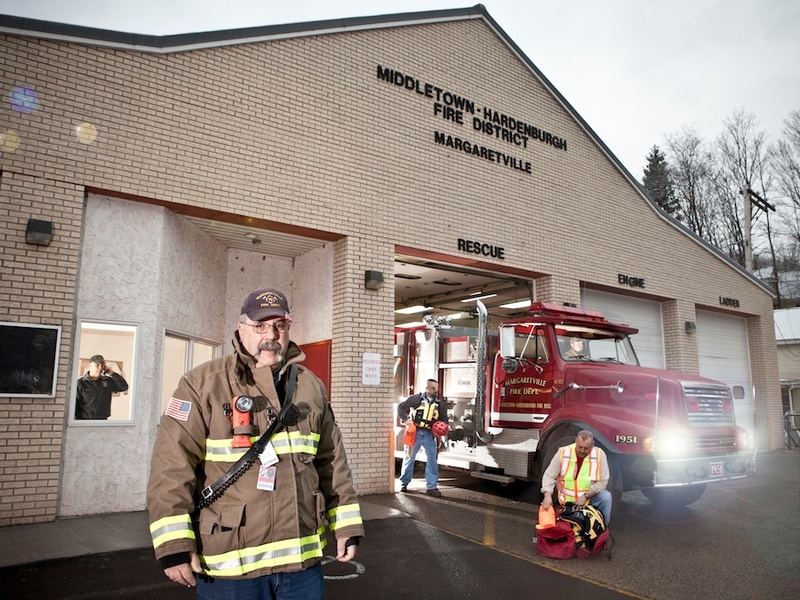 How did you coordinate Middleburgh’s volunteer effort? The next day [after the storm], I was at the village hall at 8am. I knew somebody had to be there. Main Street looked like Beirut. It was like a war zone. I got a clear picture of just how bad it was. Monday, I was organizing things. I didn’t know what to do, so I got information on who needed help. Tuesday, I started sending out the volunteers. [We held an] emergency village board meeting. It was touch and go for a while. By the end of the week, it actually almost felt manageable. I had a list of volunteers. I had a list of people who needed help. I had a placard outside that said, “Who Needs Help.” The Red Cross came, [Schoharie County Community Action Program] came. I met a lot of people. We organized over 100 volunteers. That was just with the village. There were people coming in who didn’t report to us. How has your life changed since the flood? Running for mayor? I was probably going to do it anyway. I had my mind pretty much set on it. I’m still 25, and I think a lot of people before the flood liked me, but didn’t necessarily see me as the mayor. One of our former mayors, I asked him for support, and he said to me, “Before the flood, I thought you were a kid. And then during the flood, I saw you doing what the mayor is supposed to be doing.” I think it earned a lot of respect. Text by Julia Reischel. 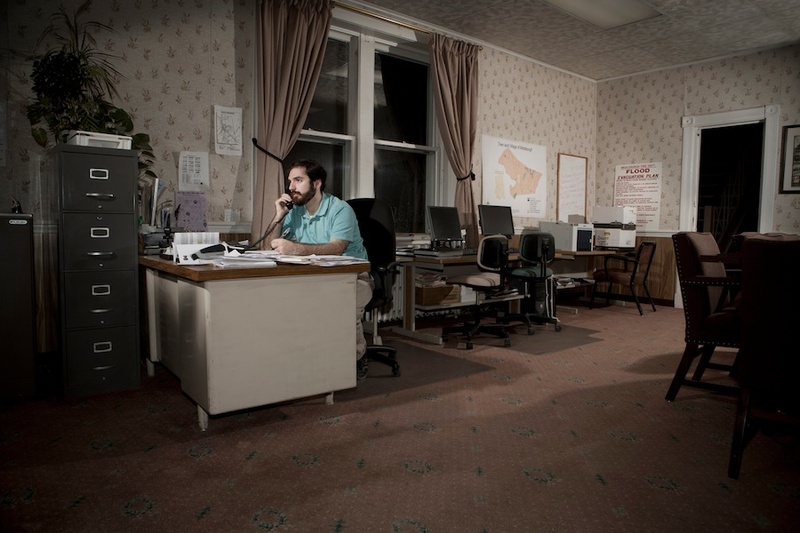 Photo: Matthew Avitabile in the Middleburgh Village Hall, where he worked for weeks after Tropical Storm Irene as a village trustee. Photo by Christopher Auger-Dominguez. As Tropical Storm Irene poured down on Claryville, Biscuit Brook began to flood the Frost Valley YMCA. The river washed out roads on either side of the camp's 6,000-acre campus. Fields became rising lakes and fish swam over cement walkways. Nearly 150 people were staying at the camp, 40 of them children visiting from Manhattan, and they all needed to be moved from the flood's path. Jerry Huncosky, the Frost Valley YMCA's live-in president and CEO, took charge of getting everyone to higher ground. After making sure students and staff were safe, Huncosky went to his office. Looking out his window, he noticed something peculiar about a wood and stone cabin outside. “The building was white and I couldn’t understand why, then I realized the wall was gone and I was staring into the building,” he said. As he watched, there was a loud crack, and another wall of the building crumbled into the river. Bunk beds tumbled into the rapids as the structure lost its grip to the ground. "The building somersaulted into the river,” Huncosky said. The collapsing building was just one of Huncosky's problems. More than 50 horses on the property were housed in stables that were flooding out. Huncosky cut the gates and let the horses find their way to higher ground. “There were horses everywhere, including in my front yard,” he said. The YMCA was completely cut off from the outside world. So were their neighbors on Oliverea Road. So Huncosky and YMCA staff invited them over. About 40 people accepted, and for about a week, the Frost Valley YMCA provided showers, food and electricity to those who needed them. With over $1.4 million dollars in damages and no insurance, Huncosky hopes to raise the money to fix the camp through donations. Frost Valley has already raised $300,000 and plans to continue fundraising through 2012. A year later, and the clean-up isn't done. There are bright spots to the YMCA's ordeal, Huncosky said. Text by Francesca Rogo of the SUNY New Paltz journalism program. 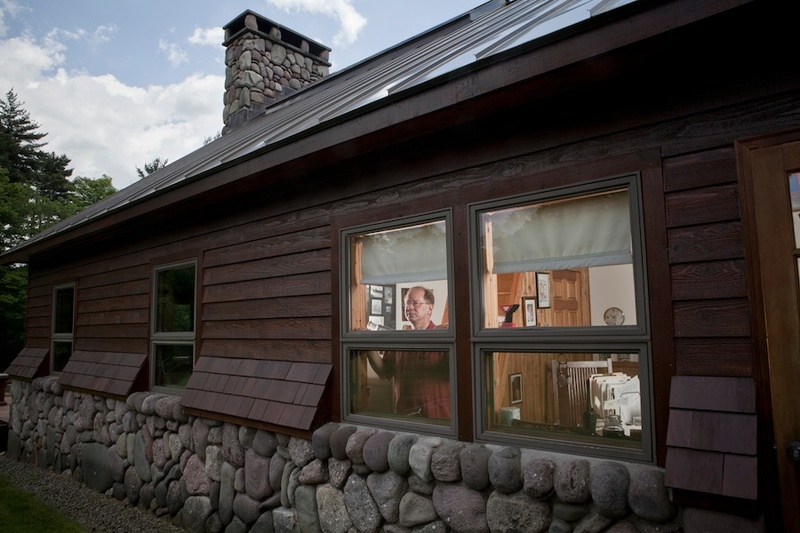 Photo of Huncosky in his office on the Frost Valley YMCA campus by Christopher Auger-Dominguez. Barber is a 5th-generation family farmer who farms 400 low-spray acres in the Schoharie Valley. On August 28, 2011, eight feet of water covered her fields and greenhouses, full of late-summer produce. Her house was flooded as well. She estimates that it will take seven years to recoup the money lost in the flood. Our farm got clobbered. We were blessed because we got water that came from Blenheim and Prattsville, and we did not have all of the contamination issues like Schoharie did with the oil and petroleum. We lost our home. There was damage done to buildings, tractors. We worked fast, and the mechanics that have always serviced our stuff jumped into action. Anything that had an engine or a motor in my greenhouses or my storage facilities, that was gone. We lost our whole fall crop. Our roads were cut off. The road down in Blenheim, that was closed until December 7. Anybody trying to get to us, they couldn't. We think it's going to take us about seven years to recoup that money. We're going to be paying monthly for seven years to make up for what we couldn't pay back last season. This year, we're still trying to get back to where we were. At this point, we're doing very well, because we borrowed a lot of money, and we also got money through the state and federal government to repair and clean up and do field cleanup. I am the president of Barber Family Farm, Inc. My nephew is vice president, so we're a family farm, ever though we carry that "Inc." thing. 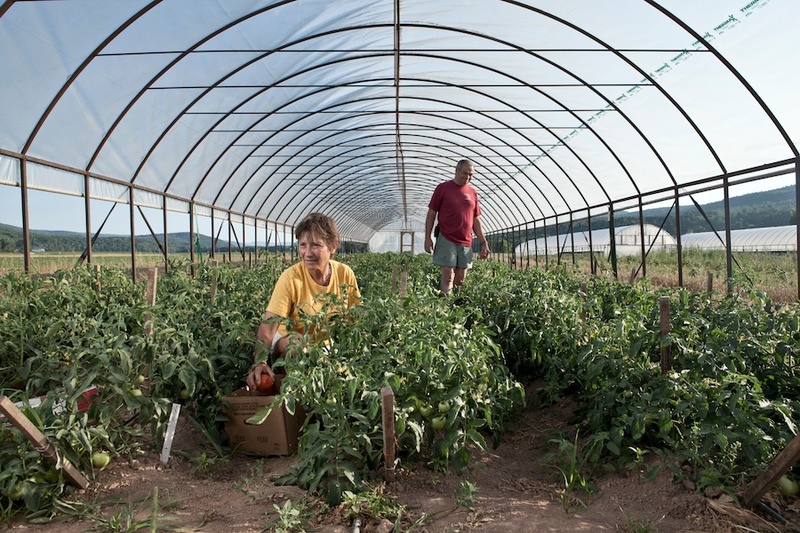 "Corporate" farms, a lot of times, are just two generations trying to make things work. We farm 400 acres. Annually we put 180 acres into vegetable crops, which we sell at our roadside farm market and at a couple of satellite stands. We employ up to about 50 people during the season, so you can see right there with the economy, if I can't reinvest in my business, that am I going to downsize. These are part-time people, so it's going to be college kids, teachers, retired folks. We are low-spray. Everything is hand-harvested, which is very labor-intensive. Our labor bill is huge. Our labor bill takes up more than half of our income. We have a greenhouse operation, and we grow about 150 different varieties of vegetables. We sell pretty much everything. I guess 80 percent of what do is direct marketing, meaning we sell from one of our farm stands. We do 80 acres in crops each year, and then other 220 acres would be done in cover crops for soil nutrients. We are trying to go towards sustainability for years and year and years. That's one of the reasons why our land fared as well as it did during the flood: it was because we had so much of it still in cover crops. It wasn't bare ground. This types of of plant cultural practice helped us in the long run because we didn't have so much erosion. Our biggest problem wasn't so much that we lost a lot of topsoil, it was that we gained a lot of gravel. Our equipment was buried in gravel. We put our equipment up high, not expecting that water was going to come running down the hills and tributaries to bury our equipment and tractors in gravel. We freed it up. That's the kind of thing that the grant money went towards: to remove gravel, to fill holes. Text by Julia Reischel. Photo: Cindy Barber in a greenhouse that, during the flood, was filled up to the roof by floodwaters. Photo by Christopher Auger-Dominguez. On August 28, 2012, Rosa coordinated a vast effort to rescue villagers from the rising waters. Many of those trapped needed to be rescued by water in small boats, including a rowboat. One man Rosa helped rescue had to make a tough decision: Do you rescue the family pig? I basically went without sleep. It covered the gamut from actually physically jumping in the water to help rescue people to organizing and managing the rescue effort. The people on Main Street -- I was one of the ones in the boat rescuing the people on Main Street. We took a three-year-old out by boat. When things got crazy, it was all hands on deck. That's what we did. We had to worry about all the people in the town of Hardenburgh who were cut off -- we organized welfare checks on them. I was in the firehouse for about 12 days straight. I had gotten up early that morning. I had set my alarm clock to get up early because of the weather forecast. I was only up for five minutes when I got a phone call from one of the past chiefs of the fire department that lives way up in the town of Hardenburgh, telling me that there was three feet of water going over the road there. That was six o'clock in the morning. So I went out the door and headed in that direction, and I could only go up the road a couple of miles. Lo and behold, it was all flooded. So at the point, I headed back to Margaretville and started the process of getting my people prepared for the worst. Where did you get all these boats? We ended up putting our [fire department] boat, which was just a rowboat, into service on Main Street. I knew then the flood was coming, so I made sure that we had fire trucks over at the hospital on [the other] side of the river, and we made sure we got an ambulance on our side of the river. And then, when it started on flooding Main Street and we knew we had people left that we had to try to get out, that's when we started using our ladder truck and our rowboat. The county had already called for a boat from Sidney, so they came in from that [opposite] side [of the river] and actually brought their boat across to us. That was at ten in the morning. One woman died in Fleischmanns, the village next to Margaretville. Were you worried that people in your jurisdiction might die? When I finally heard that they had had somebody killed in Fleischmanns, I was not surprised at all. I was very worried that we were going to have a loss of life. I think [the fact that no one died in Margaretville] was part being lucky and part just getting the job done, as far the first responders went. There's a story in Margaretville about rescuers trying to help a man and his pig. Tell me more about that. I was on the boat when we went up to get Butch Wiliams, and he had to leave his pig. When we got there with the boat, Butch and his wife and his mother-in-in-law were there, and he was in the house with their dog and his pig. There was nothing special about the pig. He was raising the pig probably for pork. But it was out back when it started flooding, and he ended up bringing the pig inside. When I got there, the water was about three-and-a-half feet deep instead the house. We were all wading around in it. The pig was able to stand and hold its snout up above the water, and that was about it. It took two trips. First, we loaded Butch's wife and his mother-in-law in the boat and took them back and dropped them off, and I stayed there with Butch. I said, “You can take the dog, but they're not going to let you take the pig.” It was too heavy to pick up and put in the boat anyway. But I told him, “Don't worry about it. The pig will probably be floating around on furniture and he'll probably be waiting for you tomorrow.” And sure enough, he was. The pig survived. It had a happy ending. How do you feel about the flood one year later? Well, you know, I have kind of totally forgotten about everything, which is kind of nice. And then you start seeing the articles come out talking about the one-year thing, and then you think back on it a little bit. I'm not sure if it's hard, or if I'm relieved that I'm not doing it this year. Text by Julia Reischel. Photo of Gene Rosa and other Margaretville volunteer firefighters at the fire hall in Margaretville by Christopher Auger-Dominguez. Eisel owns Prattsville's only supermarket. Irene flooded the store, but the community worked to re-open it in just 19 days. I got a phone call on Sunday morning from the store. I was at home. And my employee heard on the radio that cars were floating down Main Street in Windham. I didn't think it was raining that hard. I said, "All right, I'll be right down." I came down into town, and the creek was high, but I've seen it higher. So I thought, "What the heck's going on?" I came into the store and looked around, and nothing was going on. This was at 7:30am on Sunday. Within one hour, water was running down Main Street. Then I decided, "it's time to go." I just told them -- three girls and myself -- I said, "Let's go." By the time I got on the other side of the bridge, I was driving through a foot of water. I've been through a few of the floods before, and we've never really gotten any water in the store. Most of the time, this all happened when there was snow, and this was August. I didn't get back until Monday morning. You know, you pace back and forth at home. I was in contact with the fire chief at the firehouse, who was sending me pictures, and of course it wasn't looking too good. I came in at about 5:30am Monday morning. I walked to the store. We couldn't get across the bridge, so for about a mile and a half we had to walk. I saw water coming down Main Street. Most of the water had receded. All the houses were twisted and turned and it was just an eerie, eerie quiet, almost like a bomb went off feeling. That's what it looked like. Everything that could have floated, floated towards the front door. More or less the water just seeped in, picked up stuff of the shelves, and threw it on the floor, where it floated around. And then it receded and I walked into about three and a half inches of mud, plus everything that was on the bottom three shelves. It's hard to say, but the first two days, there had to be between 70 and 80 people in here, and some of those people were affected themselves. So it was amazing to see that the was that much support in the town. You don't think you get that kind of support until something like this happens. This became the community center. I have the biggest parking lot in the town. It became the common post for everything. FEMA and everything. And now you're fully reopened? And we're going to be bigger and better. It's going to be better. Text by Julia Reischel. Photo: Jim Eisel in the Great American, by Christopher Auger-Dominguez. Michele Arana escaped Irene on horseback twice. The morning of the storm, the property where 21-year-old Arana lived with her Arabian horse, Mandi, was under an evacuation order. Arana, who lived in a rented house on the grounds of a boarding stable with an absentee landlord, checked on the horses hourly. At first, nothing looked too bad. But Arana began to worry after she received a call from another boarder, who said that the Wallkill River was supposed to rise and put the property, which is on the notoriously flood-prone Springtown Road in New Paltz, under water. “My heart sank,” said Arana. Arana grabbed her essential belongings and then jumped on Mandi, who had on nothing but a rope. Step by step, woman and horse picked their way along the six-mile ride on the rail trail from New Paltz to Rosendale, where she had friends with a house. Before long, they hit trouble. Standing in knee-deep water, at one point Arana'a path was cut off by five fallen trees. On one side was a water-filled ditch; on the other, a barbed wire fence. Arana decided to take the path through the water. Within a few steps, Mandi whinnied. “I thought she broke a leg,” Arana said. But the horse had just hit a patch of unstable ground. She kept walking. Eventually, they found a hole through the barbed wired fence. It was a huge relief when Arana made it there with Mandi that night. But Arana couldn't stop thinking about all the other horses she had left behind. “The big issue was that there was a miniature horse at the barn that could drown if the water rose too high,” she said. The next day, another person who boarded horses at the Springtown Road stable agreed to go with her to rescue the others. On their way back, Arana prayed that there would be no water. But the closer they got, the higher the water rose. The barn was full of horses standing in high water. After feeding them with floating bales of wet hay, Arana and the other boarder each rode a horse and had the miniature horse follow them. At some points along their escape the horses panicked, but eventually they got the three to the Rosendale barn safely. Still without clothes or shoes, Arana returned to her house on the Springtown Road barn property to find that her car and home were flooded. Now, at their new barn in Wallkill, Arana stands hugging Mandi’s neck and smiles. How long did you have Mandi before the storm? At the time of the storm I only had had Mandi for a month and was unsure how she would act not being fully trained. She was really good though. In the end, I think I panicked more than she did. I also hadn’t been living in my apartment that long either. What did you do to prepare for the storm? I bought a bunch of burritos from Mexicali Blue. Then, when I realized it was getting really bad, I grabbed all my essentials, like my Social Security card and stuff. Then I put everything else important on my air mattress hoping if the house flooded it would just float. What happened with your dog? [Arana has a 14-year-old Beagle named Snickers who also was rescued from the flood]. One of my friends actually canoed my dog to safety because I knew he was old and wouldn’t be able to make the trip. It was funny; he didn’t really seem to care about everything that was happening. How did you go from losing your place, your barn and all your clothes to where you are now? One of my friends from Poughkeepsie came to New Paltz and brought me clothes and shoes. I still have them today. Then another one of my friends let me keep Mandi at her house until I found a temporary boarder. Also, Jesse, the woman who rode the horses with me during Hurricane Irene, was about to rent out a room in her house, so she offered that to me. Everything worked out really well. What happened to the other horses? We didn’t know what to do with the others because we couldn’t get ahold of their owners. We did everything we could, like feeding them and leading them to higher ground, and they ended up being okay in the end. Text by Katharyn Sophia, of the SUNY New Paltz journalism program. Photo: Michele Arana and her horse, Mandi, near their new barn in Wallkill, NY. Photo by Christopher Auger-Dominguez. In the 20 years Jack and Kathy Jordan have lived in Lexington, N.Y., they have seen storms flood their roads many times. Tropical Storm Irene left homes completely destroyed, collapsed nine bridges in Lexington, and stranded most of the town from the outside world for weeks. It was the Lexington Food Pantry, run by the Jordans, that kept neighbors in high spirits and with full bellies during that time. The Jordans’ food pantry had only opened a few months before, in May 2011, after opening their church, the Lexington Mission, in April. Before the hurricane, the pantry provided about 15 families with meals one Saturday a month. During the hurricane, the food pantry became the heart of the community. When the power went out all over town, people brought the food from their freezers to the pantry and church to be given to anyone who was able to get there. Two hundred people showed up daily to receive breakfast, lunch and dinner. There were at least 30 volunteers on hand at any time, and more showed up during meals. Children joined their parents in volunteering by folding clothes, serving food, cutting vegetables and riding their bikes to get clean water. The Jordan’s granddaughter celebrated her third birthday in the middle of the hubbub. “She thought it was great because there were hundreds of people around serving lunch,” Jack Jordan said. One elderly volunteer drove from Hunter with trays of ziti for the pantry. The woman could barely lift the trays from her back seat, but she still felt the need to help in any way she could. “Those are the experiences of people who have come into our life for a brief minute,” said Kathy Jordan. A year later, abandoned homes of families who have yet to return can still be seen. The creek banks are eroded, farm fields are now filled with boulders and rocks, and debris is strewn through the streams. But the Lexington food pantry continues to thrive and help families. After the storm, the pantry received enough food to open its doors every Saturday. It now feed an average of 30 families weekly. How did you come to open the food pantry? Kathy: We opened up the church in April 2011, and then we started the food pantry. My husband felt a call to do that. We started the food pantry in May, and we were only doing it once a month. 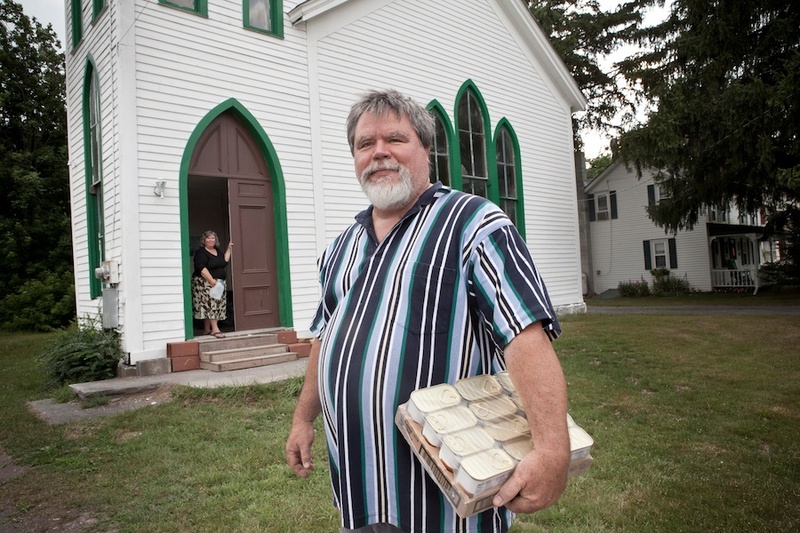 We would have tubs of food that we stored in the church. Then when Irene hit, which was in August, the woman who owned the store across the street let us use the store. We moved in during that week, right after Irene. We had so many volunteers that were over there stocking shelves, and we were on the other side feeding people. How is the pantry doing now, a year later? Kathy: The rent was free, but we had to pay the electric, and so we can't afford to stay there. We only get a couple dollars in donations. So we're in the process of packing up and moving back to the church, which is a tremendous amount of work. We run solely on donations, and we don't receive any federal funds or town funds. It's just basically donations from churches and individuals, and we just couldn't. Kathy: It's Baptist. We've found that to so many, it didn't matter – we just had so many volunteers after Irene. We had this one guy come up from New Jersey. He said, “I'm here, is there anything I can do?” We were like, “Do you like to cook?” And then he was on the grill, and he stayed for a long time. Several days. There were so many people who just came. Because you couldn't do it by yourself. We lost so many bridges, and people were stranded. We had people who called [Lexington] “The Island.” They just kind of banded together and went from house to house, eating. One lady, she had OnStar in her car, and they'd get in the car and push the OnStar button, anyone who needed to make a phone call. Text by Lauren Scrudato, through the SUNY New Paltz journalism program. Photo of Jack and Kathy in front of the Lexington Mission by Christopher Auger-Dominguez. Dorothy Maffei calls the clothing donations "the tsunami after the hurricane." Flood victims need new, clean clothes in the first few days after a disaster. So Maffei, a volunteer who ran recovery operations for the village of Margaretville out of her store after Tropical Storm Irene, began accepting donations. Soon, the flood of clothing was its own disaster. Under the impression that they are helping, many people used the flood as an excuse to clean out their closets. Soon, every church and fire hall in Margaretville was crammed with musty sweaters, smelly shoes, and moldy stuffed animals. Volunteers had to be recruited just to fold and sort the tons of offerings. There was no way to get rid of the excess quickly -- for the short term, it had to be stored. The solution was an old factory in the hamlet of Arkville that once manufactured baseball bats. Maffei and other village volunteers did the backbreaking labor of bagging and hauling the tons of clothing there. The warehouse couldn't hold it all -- the excess went into rented dumpsters that had to be paid for by private donors and out of flood relief funds. Maffei thought that she only needed the bat warehouse for a few weeks. A year later, she hopes to get it empty by the one-year anniversary of the flood. "We are committed to closing it by the end of August," she said. "We are now working with the City Mission of Schenectady to give them all our excess clothing. We are working on bagging and boxing it now so they can take it." Managing the flood of clothing donations was only a fraction of the volunteer work Maffei did after Irene. She transformed her store, which wasn't damaged in the flood, into an emergency response center. She put in a second phone line. She bought supplies and began handing them out. She organized teams of volunteers who cleaned out buildings and relocated homeless flood survivors. Soon, when anyone in Margaretville needed anything recovery-related, they went to Maffei. They're still doing it a year later. "My background was production and stage managing for off-Broadway shows," she said. "Give me a clipboard, and I know what to do." What happened to you during the flood? I was out of town in New Hampshire, where they had no power. It took me ten hours to get here through Vermont. I finally got here, jumped the barricade, and checked out the store. Then some friends said: "They need food at the fire hall for breakfast." So the next day, I turned the store into the volunteer center, and put in an extra phone line… We used this as the center of everything. I would liase with the fire department and the town people... We put together fact sheets about how to prevent mold, and then we just started working 24/7. There were some wonderful people involved. People came from all over. I know that getting supplies and handling donations was a huge problem. How did you deal with that? How long were you in emergency mode? You know, I barely remember it. Six weeks, I think. What was one of the moments you remember best from the flood and the recovery? One of the great moments was the first or second Sunday, when this huge group of boys' and girls' soccer teams came from Delhi and helped clean out the buildings on Main Street. Another moment was when they evacuated all those buildings during the flood. Only one person could go in at a time, so they were passing their belongings out one by one. Text by Julia Reischel. Photo: Dorothy Maffei in an Arkville warehouse where she and teams of volunteers sorted and stored tons of clothing donated after Tropical Storm Irene. Photo by Christopher Auger-Dominguez. The only thing they can’t get rid of is what the mud left behind. “Dust, dust, dust. A fine, fine dust,” said Rich Vilegi. The three feet of black sludge that bubbled through the floorboards of their Main Street hardware store got into places you’d never expect. Inside shrink-wrapped packages of hardware. Lining each and every thread on a screw. And it smelled. Nobody ever tells you about the smell. “It was like a mixture of sewage, and dirt, and a few rotten things,” said Heather Vilegi. The color was all wrong. Blacker than mud. Mud was the first thing they saw when they walked into their store on the Sunday morning of what was supposed to be a booming Labor Day weekend. Half their stock was destroyed. “Our first instinct was to lock the doors and move away,” said Heather. “To see everything ruined. Thinking, are we going to stay or go? It was unbelievable,” said Rich. But the local hardware store is a popular place after a flood. People showed up almost immediately. They began grabbing hoses. Sluicing out mud. Buying tools and supplies on the honor system, since the cash register was still broken. So the Vilegis began to rebuild. They ripped up the floor and tossed load after load of ruined hardware. The store re-opened within a week, to the applause of their customers. But the mud doesn’t give up easy. “You sweep the floors, you still find dust,” says Rich. Text by Julia Reischel. 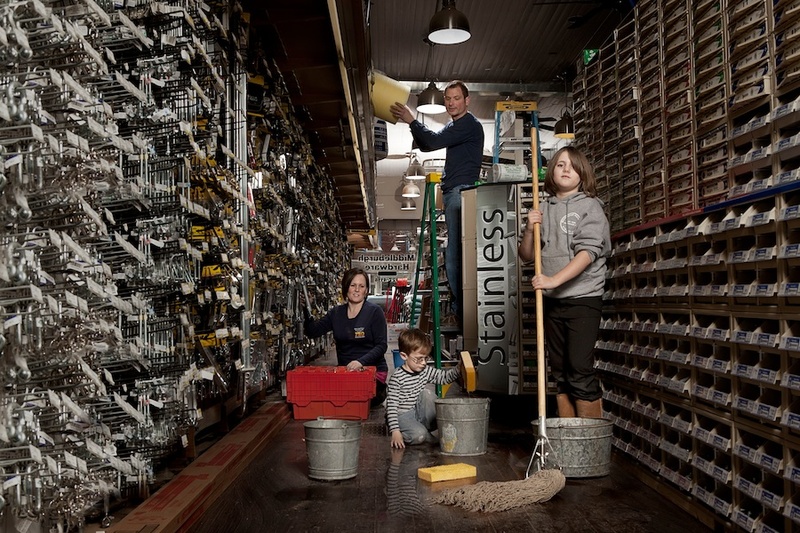 Photo of (clockwise from top left) Rich, Juliana, Ian and Heather Vilegi in their store by Christopher Auger-Dominguez. If the Gilboa Dam breaks, the reservoir police barracks beneath it will be the first to go. So the morning that Tropical Storm Irene arrived, 40-year-old Captain Brian Handy drove uphill, alone. On State Route 990V, about 50 yards upstream of the dam, Handy parked and watched the Schoharie Valley fill with water. The dam held. But downstream, roads disappeared. Warning sirens wailed. Towns and their command centers evacuated. Communications winked out. People ran and drove to the hills in panic. From his SUV, Handy ordered his people -- DEP officers stationed from Gilboa to Ashokan -- to help. DEP police began routing supplies around washouts. Charting road closures. Guarding sinkholes. When other officials couldn’t respond, the DEP did. For weeks, Handy’s officers handled Schoharie County’s 911 calls. The DEP isn’t popular in the Catskills. It’s the history: The city came in from the outside, flooded valleys, and hired a police force to protect the reservoirs that were once towns. Still, when Handy hears negative comments about the DEP, he takes it personally. 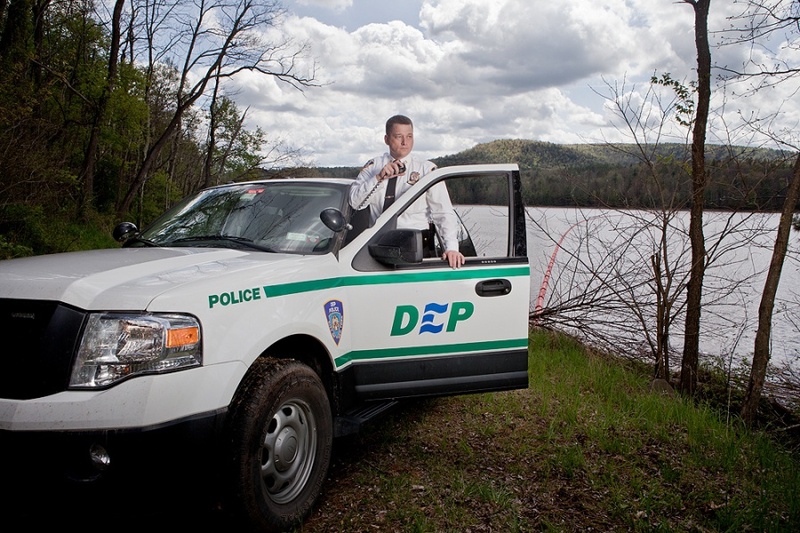 I run the West-of-Hudson Patrol Division for [the DEP]. So for that specific day, here in Gilboa, we were stationed here in anticipation of the wet-weather event in case Hurricane Irene decided to come. As the weather continued to come, we made all the preparations in advance that we possibly could make, and then the emergency action plan was activated. For us, the emergency action plan required us to relocate, move our precinct, and set up an interim command post. We moved to the top of the dam and established a command post where we monitored what was going on … We would be the first impacted in a significant event at the dam. I established a command post in my vehicle. We have robust communication abilities in our vehicles. Mine's an unmarked SUV. There are roads that are closed, there are resources to bring -- how do we get them from one place to another? And in addition to that, I have the daily operational needs of the agency. I’ve got other precincts, all of my staff, a lot of them live in the communities impacted by the floods. Their families are in those communities. How do we get people in the next shift, how do we get people home … It was an incredible amount of professionalism and dedication. No matter how much I asked them to do, they were incredibly willing and eager to do what they had to do. What do you wish people knew about that day that they don't know? That's the one thing that I would like them to know: You do see negative comments about the DEP and what they do. For me, I take it very personally. I'm here. I'm born, raised and grew up here. We are local people that comprise the DEP. We take our job very seriously and appreciate the opportunity to serve. There was a lot of panic and misinformation about the Gilboa Dam during the flood. Did you hear or respond to the rumors that the dam had broken? In the instance you’re referring to … there was some confusion at some point about a problem, and the radios got really busy. One of the concerns was that the dam had broken. We were on the dam, and we were quickly able to relay that information: “We are on the dam, there is no [break]. Text by Julia Reischel. Photo of Brian Handy and his DEP vehicle parked upstream of the Gilboa Dam off State Route 990V, where Handy spent Tropical Storm Irene. Photo by Christopher Auger-Dominguez.